Spirit and I had a good morning session at FW3. 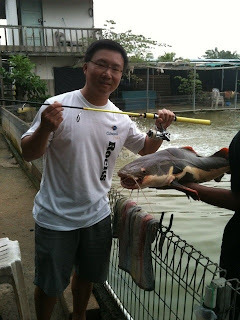 I managed to land 2 Red Tail Catfish, 2 Patins, 1 big tilapia, but has 3 burst lines. Eric managed to land 1 Red Tail Catfish, 1 Patin, but lost 1 Patin and 1 Seabass, and 2 burst lines. Overall, I would think it was a good session at FW3 as everybody manage to fight at least one sizeable fish and land it, despite of the light drizzle there. btw bruce. u joining us for the 7th dinner? 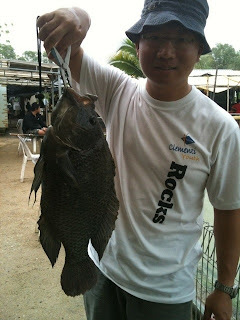 Hi Xeno, I dun think I can join u all for dinner on 27 Aug. May need to work late for that night. Chicken liver used as bait and started fishing from 8am-12noon. 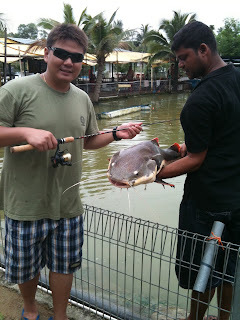 Golden timing is from 8-9.30am as the bangala feeds the fish between 8.30-9.30am.